At our house, we make it a point to have family meals as much as possible. We have dinner together at least 5 nights per week and often have breakfasts or lunches together on the weekends. When I say “together” I mean that we sit down at our table, eat the SAME food and have CONVERSATION together as a family. It is important enough that I decided to write a blog post about it. 1. Family meals create conversation that otherwise wouldn’t happen. At our family meals, we have intentional conversation that would likely not happen outside of these meals. When we sit down together over a meal, each person has the opportunity to share the events of his/her day. All of this is a learning experience. As we interact with each other, our kids are learning to communicate, make eye contact, celebrate each other’s accomplishments, and listen well as others talk. One of our greatest challenges has been teaching our kids not over talk each other. Good communication is critical for a healthy family. The dinner table is a daily opportunity for us to do this. 2. Family meals facilitate quality parenting moments. Many of our best parenting moments come at the dinner table. At the table, we teach our kids all sorts of things that will help them to be successful adults in society. We teach them the truth of who God is, we encourage them, and we correct them in the safest environment that they will ever experience correction in. All of this happens because of the intentionality that comes with a communal family dinner. 3. Family meals require our kids to eat foods that are good for them. Today’s kids grow up eating chicken nuggets, pizza, and kids meals. We all know that we live in an obese society. Food choices are clearly a big part of this issue. At our family meals, our kids eat the same healthy food that we do. We don’t make them eat lima beans because we don’t like lima beans. But they do learn to eat salad, vegetables, beans, and other things that they would not choose to eat on their own. Just a note: We aren’t fundamentalists about this. We always make sure that part of the meal is a food that they like. If we are eating a vegetable that is not their favorite, they have to eat at least a couple of bites of it. Studies show that a food has to be tried ten times before a child develops a taste for it. 4. 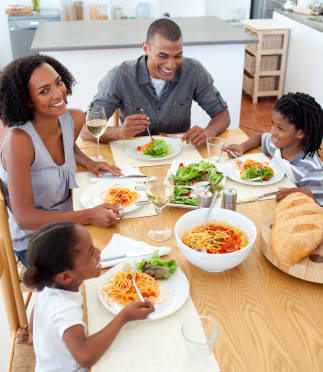 Family meals improve your kids’ overall physical health. When kids have to fend for themselves all of the time they primarily eat crap. By coming together and eating a meal together, (that is not Taco Bell) our kids are eating better foods, and not eating an endless supply of ice cream sandwiches all day. I encourage you to make this a priority for your family!